This vintage looking American Flag is made out of 34" Hard Maple & Ash Baseball Bats along with game worn baseballs cut in half. 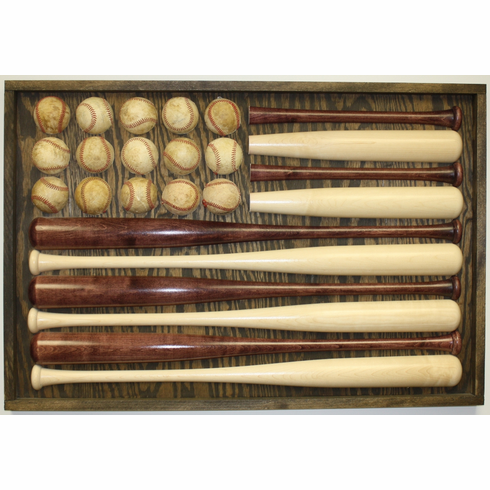 Bats & Balls are individually placed to create this beautiful flag that would look great in your baseball home or office. Bats are done in Mahogany & Natural clear finish and the Flags backing and trim are finished with a Rich Walnut stain which enhances the rustic feel of this piece. Each flag is handcrafted which makes each one a unique piece of art. Measures appx. 37 1/2" x 28 1/2". Includes 2 heavy duty hooks on the back - easy to hang with just 2 screws.